Complex issues get a facile treatment in The Net, the latest work from Korean provocateur Kim Ki-duk. More coherent than his last two outings but a far cry from his best work, Kim's film comes off as little more than a simplistic sermon brought to life through routine indie specs. The narrative kicks off with an intriguing premise, as a simple North Korean fisherman helplessly drifts south of the heavily guarded Joint Security Area when his fishing net gums up his boat's engine, which becomes an effective, if labored metaphor for the various situations the man finds himself in. 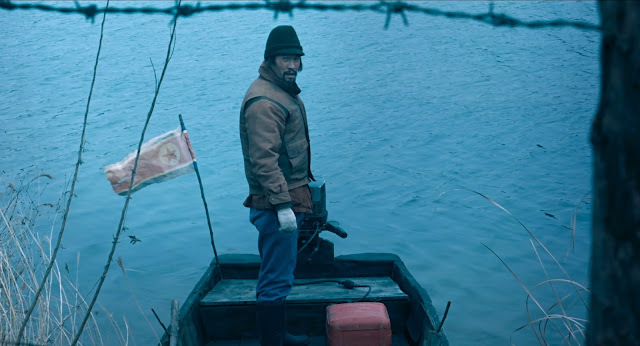 Korea's National Intelligence Service puts him through a lengthy interrogation and eventually tries to turn him rather than fulfil his wish to return him North to his family. Ryoo Seung-bum follows last year's lamentable Im Sang-soo action-comedy Intimate Enemies with a rare indie part as the stranded North Korean. Gruff and cagey, its a solid central performance that plays against type and yields the film's only character who rises above wafer-thin, if only just. Making a point to show that South Korea, for all its upward mobility, can be just as controlling as its maligned northern neighbor, Kim employs straightforward situations to repeatedly bring home his tired moralizing. Most scenes serve a function, even if they lack entertainment value, but over the film's 113-minute running time, there are some sequences that belabor the director's already stated points and might best have been excised entirely. One of these is an encounter where Ryoo's not-quite-prisoner roams the streets of Central Seoul and ends up saving a prostitute from a pair of thuggish pimps and befriending her. She offers her body to him as a means of repayment, which he declines, an action that implies the crass consumerism of the Far East Asian republic but which the director does not seem to think is inherently problematic from a gender perspective. We don't look to Kim Ki-duk for technical panache the way we might of Korea's big-budget filmmakers but even so, there's little beyond the bare essentials here as the film lacks the lyrical beauty of some of his early films or even the busy and ascetic grit of his recent works such as Pieta. Unfortunately it most resembles his confused and plodding One on One, the most flatly filmed Korean revenge thriller of recent memory. The only real visual flair comes when the fisherman is in his boat, as his dinghy drifts through the frigid lapping waters of the Korean coast. Noble in its own unambitious way, The Net amounts to a watchable if frustratingly thin quasi-arthouse drama from a filmmaker whose done so much more with less in the past.